Long Range Targets out to 300 yards. Single Shot and Lever Action Categories. Grab your shotgun and journey up to the Founders Ranch Shotgun Sports Club for a round of Cowboy 5-Stand! Wild Shot and Mrs. Slick Shot will host this fun side match. Your first round is free with a paid Buffalo Stampede main match entry. How many bullets can you split with five revolver shots? How many cards can you cut with five revolver shots? 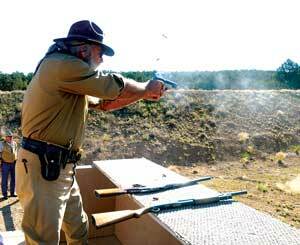 Meet Tex and shoot three stages. Bring your single shot rifle, percussion pistols, and shotgun and compete in a 3-stage Plainsman match that will test your metal!